We’ve assembled a bunch of useful information about the trio. Please browse around, give us a listen and let us know what you think. 3-minute Introductory Video (EPK) – a quick sampler of TRI-FI from our 2014 performance at WVIA Public Television Studio. Visit our video page for more performances. For ten years TRI-FI has been creating original jazz music, developing a personal style that is contemporary while still deep in the tradition of the classic piano trio – a sound that is fresh and unique but somehow familiar. Unlike so many of the thrown-together pickup groups on the jazz scene, TRI-FI is a real band: a cooperative trio of award-winning musicians that has been playing their own original music together for years, with all three members contributing compositions. 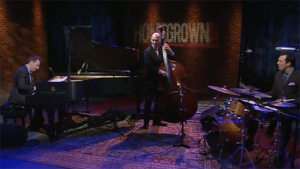 In 2003, Matthew Fries (winner of the Great American Jazz Piano Competition), Phil Palombi (Grammy Award winning bassist) and Keith Hall (respected educator and director of the Keith Hall Summer Drum Intensive) were brought together as the rhythm section for singer Curtis Stigers and toured extensively playing at many of the major jazz festivals including Montreux, North Sea, Rochester, Montreal, Toronto, Vail and Aspen. 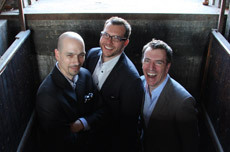 TRI-FI formed the trio as a workshop to create and perform original music, rooted in their jazz history experience but fresh in its modern style. In early 2014 TRI-FI will be celebrating ten years of composing, performing and recording together with the release of a 5th album entitled Staring into the Sun. Pianist Matthew Fries is making waves in the jazz world as both a soloist and accompanist. The winner of the Great American Jazz Piano Competition, his debut album, Song for Today (TCB Music) was named a 2001 critics pick by Jazziz Magazine, and his recent work with his collaborative trio, TRI-FI, “takes on the Jazz Trio challenge and delivers a ‘knock out’ punch” (Jazz Review). As a sideman his work has been described as “the best jazz accompaniment I’ve seen in a cabaret in years” (The New York Times), and “the crispest rhythm section imaginable” (The London Times). Originally from Selinsgrove, Pennsylvania, Matthew now lives and works in New York City. He tours internationally with singer, Curtis Stigers, as a regular member of his band and performs with a diverse lineup of artists that has included Stacey Kent, DeeDee Bridgewater, Vincent Herring, Steve Wilson, Dave Samuels, Claudio Roditi, Terell Stafford, and many others. Drummer, Keith Hall has established himself as a joyful performer and passionate educator. He has performed with Betty Carter, Sir Roland Hanna, Michael Phillip Mossman, Luciana Souza, Steve Wilson, Joe Wilder, and tours regularly and records with Curtis Stigers. Modern Drummer Magazine says “Hall has a nimble, grooving, ‘melodic’ touch, and knows how to tell a story,” and trumpeter and bandleader Michael Phillip Mossman calls Keith “a member of the new generation of hard swinging, versatile and musically aware musicians that will shape jazz for the next 20 – 30 years.” Keith is on the jazz faculty at Western Michigan University, he plays regularly in the band at Christian Life Center and is the Executive Director of the Annual Keith Hall Summer Drum Intensive held in Kalamazoo, MI. “Phil Palombi is one of the most sought after young bass players in New York” according to tenor saxophonist Walt Weiskopf. A Grammy Award winner, Palombi is quickly moving through the ranks of the New York Jazz elite with a musical resume that includes performances with Michael Brecker, Billy Hart, Dave Liebman, Etta Jones, Chris Potter, Rich Perry, John Riley, Toshiko Akiyoshi, Lew Tabackin, Chucho Valdes, Mark Turner, Eliot Zigmund, The Village Vanguard Orchestra and a two-year stint with the Maynard Feruson Big Bop Nouveau band. Phil Palombi recently published his first book entitled Scott LaFaro – 15 Solo Transcriptions; a book of all of Scott LaFaro’s bass solos from the Bill Evans recordings Sunday at the Village Vanguard and Waltz for Debby.